Modern one bedroom apartment located in a Tower full of amenities in Callao Avenue and Juncal st. in the heart of Recoleta neigborhood. High floor with spectacular view over the city. One bedroom with double bed. Living and dining room with confortable and modern sofas and table and chairs for 4 people. Complete kitchen. Bathroom with bath and shower. 24 hours security. Swimming Pool and Solarium. Sauna and Gym. Tennis court. Bar/Restaurant in the Tower with room service. Daily maid service. Internet high speed connection. Cable TV. Phone. Air Conditioning warm/cold. Close to the main attractions of Buenos Aires City. 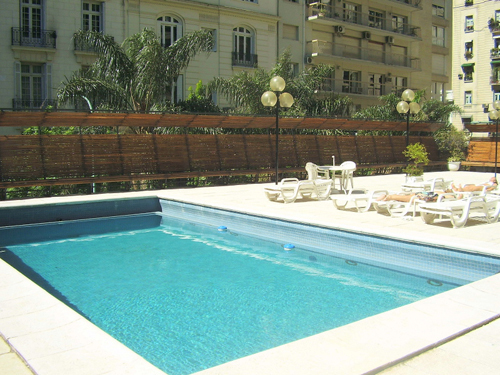 Village Recoleta, Recoleta cementery, squares, parks, nightlife area, restaurants, bars, pubs, discoteques, gym, residencial area, commercial area, laundry, parking areas. Included: Electricity, gas, water, telephone, building and city taxes. Not Included: The bill for Internet High Speed.